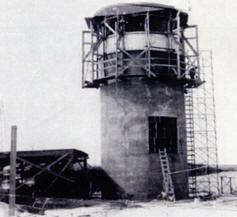 The Oak Island Lighthouse was completed in 1958 at a total cost of $110,000.00. The lights are 169 feet above the water. A misconception is that the lighthouse itself is 169 feet tall. The actual structure is 153 feet tall, but it stands on a slight rise. Therefore, the height of the light above the water is 169 feet, and it is so reported on nautical charts. There is no spiral staircase as found in most older lighthouses, but instead a series of ships ladders with a total of 131 steps to the lantern gallery level. The base is set upon 24 concrete-filled steel pilings 10 3/4 inches in diameter and 67 feet deep. 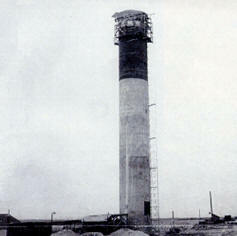 The pilings are capped by a 30 foot wide by 3 foot deep octagonal concrete base upon which the tower structure was built. The main tower is 128 feet tall, built of monolithic reinforced concrete. It was poured continuously into a movable form that was raised by jacks at the rate of one foot per hour. To accomplish this task a concrete mixing plant was set up on the site to allow for the continuous 24 hour a day operation for 7 days. The tower has a uniform inside diameter of 16 feet 4 3/4 inches. The wall is 8 inches thick, and the three stripe color pattern is permanently cast into the concrete. To establish a color for each section the first forty feet is the natural gray of Portland cement. The next fifty feet was poured with white Portland cement and white quartz aggregate for the white color. The top fifty two feet is a gray Portland cement with black coloring. The smaller diameter concrete section at the top was formed with stationary metal forms after the top floor was poured. Windows in the tower were constructed of stainless steel but sashes have been replace with vinyl. 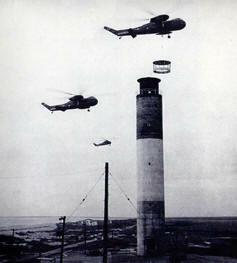 The 11 foot tall aluminum lantern housing was installed by Marine Corps helicopters. Total height of the structure above the foundation slab is 153 feet. The characteristic flashing pattern for the light is four one-second flashes every 10 seconds. The lighting apparatus in the Oak Island Lighthouse is made up of 8 aero beacon lighting fixtures, 4 on top and 4 on the bottom. When first activated in 1958, the lower bank used carbon-arc mercury lamps in 36-inch reflectors. 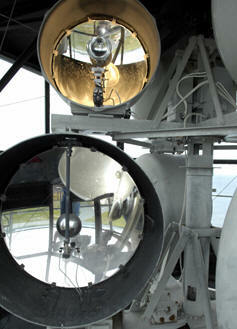 These reflectors with their housings were adapted from aircraft spotlights used in World War II. When these lamps were in use the Oak Island light was the brightest in the US and second brightest in the world. When the upper bank of lights, using 24 inch reflectors and 1000 watt incandecent bulbs became the primary beacon in 1962, the 36 inch bottom lights were decomissioned and the lighthouse lost that distinction. In April of 2010, all of the electrical supply lines, conduit, boxes, plugs and wiring were updated to conform to current codes and new 1000 watt halogen bulbs replaced the 1000 watt incandescent bulbs. The Oak Island light is located on property that has been in use as a US Coast Guard station since the 1930s, and prior to that it was a US Lifesaving Station. 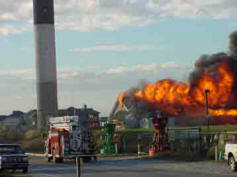 The current Coast Guard station was recently reconstructed after a fire completely destroyed the ten-year-old building in 2002. The new station house is built over the footprint of the lost station, and closely resembles the older station. 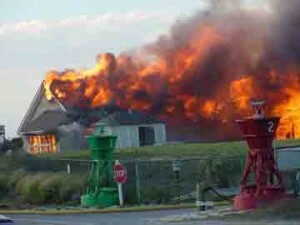 In 2004 the lighthouse and the surrounding property were deeded to the Town of Caswell Beach along with adjacent beachfront property. While the Coast Guard has retained responsibility for the upkeep of the lights, Caswell Beach now has responsibility for maintenance of the lighthouse and the grounds. The town has made provisions for additional parking as well as providing access to the lighthouse grounds and a boardwalk access to the beach with an observation deck. During the summer of 2006, the Friends of Oak Island Lighthouse began assembling volunteers and providing visitors the opportunity to tour the tower.